Questa casa di fronte all'oceano è stato progettato su misura per il proprietario con il meglio di tutto. La casa è molto ben distribuita con tutto il necessario per una vacanza in famiglia. ON-SITE caratteristiche includono: attività organizzate per i bambini, gli adolescenti e gli adulti, sala giochi, basket, un miglio di spiaggia privata con bagnini, mountain bike, bingo, canottaggio, braccialetti di identificazione dei bambini, servizi di chiesa, artigianato, concerti, balli, sconti per attività locali, la pesca nei laghi e surf, negozio di alimentari, noleggio golf cart, ferri di cavallo, sale riunioni, mini-golf, centro della natura, gazebo, ping-pong, piscine interne ed esterne (corsi di nuoto libero), sala di ricreazione, mescolano palla, spuntino Bar, sicurezza pattugliamento di 24 ore, la pallavolo, il limite di velocità di dieci miglia all'ora. Ocean Lakes è una bella famiglia orientata comunità dove si può stare tranquillo lasciando che i bambini hanno una certa libertà. This house is great for large families. We have plenty of room and do not feel cramped. We stay every year and love that we are ocean front and we can watch the cruising without actually cruising. We're so glad you enjoy the house! It is the perfect location for families who want to be in the middle of all the action! We look forward to having your family stay with us again in the future! Pictures looked great,however the kitchen is outdated counter toos very old and worn, stove rusted and old as well as microwave, windows were stained and doors were very hard to slide, on a positive note the couches downstairs were new! The bedding is awful beds and bunks extremely worn, baths were out dated and the upper deck only had two plastic chairs for sitting! The upstairs was hot until night which made it difficult for the younger children to nap! For the price paid for a weeks stay my wife and I were very dissapointed in the unit for what we paid, a 3 bedroom condo for half of what we paid for this house would have been a much better value! Over priced for the amenities given, house needs major updating and remodeling to make a value! I'm sorry your experience was not all that you hoped for. House and location very nice! Had a small problem at first but Megan took care of everything for us. We actually made a small list of things for the actual homeowner to help them save on repairs now that could turn costly! Overall had a great time!!! Can't wait to book it again! Thank you for the feedback! We always appreciate our guests who help us keep the house looking great. We look forward to having you stay again. 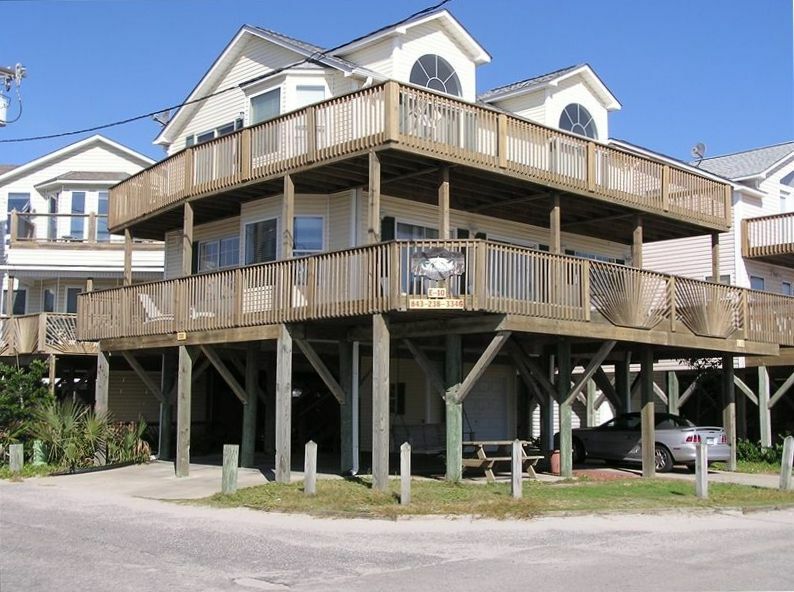 The property is located on the oceanfront with easy access to common areas, so that's a positive. Compared to other properties in the area, however, there is room for improvement. As soon as we arrived, we noticed the sliding glass door (primary entry/exit) was in such bad shape that we could barely open it. We noticed that our socks and feet were almost black after walking around the house each day- the tiles are clean, so it must be the carpets. There were multiple dead flies in the windows and dead spiders smashed on the walls. I don't think it's been cleaned thoroughly between guests. The wireless internet for this house is a shared connection with the next house, and the connection is terrible. The paper on the side of the refrigerator says you should limit connections to 2 people, and just check email while on it. We stay here at Ocean Lakes every year in different houses, and this is the first time I have ever left a review - positive or negative. I probably won't be renting from this management company again. We have stayed in this house for the past 3 years. It is large enough for the whole family. We can sit on the deck and watch the cruisers plus have an ocean front view. This house is a corner house and has two entrances to the parking spaces which allows us to come and go while cruising is occurring each night. There is a swing under the house so you can sit and watch cruisers on the swing if you prefer. The open space of the family/dining/kitchen allow us all to sit together but not be on top of each other. We normally have 9 to 10 people and we have plenty of space. We love it and have already reserved our time again next year. Thank you for the review! We're very glad you enjoyed your stay and enjoy our repeat renters. We appreciate the opportunity to help families build life long memories! We'll see you next year! We had a great time watching our kids play basketball or at the park from our ocean front balconies! Wonderful for two families to fit. Abbiamo oltre 100 campi da golf nella zona di Grand Strand. "Il proprietario di questo sito non è affiliato o sponsorizzato da Ocean Lakes Family Campground, L. P., (l'operatore di Ocean Lakes Family Campground), Ocean Lakes Properties, The Jackson Companies o una delle loro sussidiarie." ALL SEASONAL RATES ARE "FROM" THE PRICE LISTED. Pricing may change during that seasonal period. There is no way to include that option on VRBO. Ex: During the late summer rate, it is listed as $2500/week. Our summer rate ranges from $3600 the first week of August to only $1600 the week of Sept. 17-24. PLEASE CALL FOR CONFIRMED PRICING. Linens are included during peak season only.